Adobe has fueded with Apple over the fact that iPhones and iPads don't run Flash animation. Adobe says keeping Flash off of Apple products is a "risk factor"
(CNN) -- Adobe, the makers of the Flash animation platform, said Apple's refusal to run Flash on the iPad, iPhone and other products could hurt the company's bottom line. The comments were part of an official quarterly report filed with the U.S. Securities and Exchange Commission. "[T]o the extent new releases of operating systems or other third-party products, platforms or devices, such as the Apple iPhone or iPad, make it more difficult for our products to perform, and our customers are persuaded to use alternative technologies, our business could be harmed," read the report. The statement came in a section of the quarterly report outlining risk factors that could make Adobe's business not perform as well as predicted. Like other Apple products, the iPad -- released Saturday -- does not run Flash, making some games and videos unusable. Apple CEO Steve Jobs has reportedly called Flash "buggy" and a memory hog. But there's also a financial aspect to the dispute. Roughly three-quarters of the video on the Internet uses Flash, and allowing it on Apple products would give customers options other than applications sold through the official Apple store. Fortune: Why is Steve Jobs Flash-obsessed? The Adobe filing said it's hard to know what kind of products to develop when it's unclear what platforms will be able to run them. "The process of developing new high technology products and services and enhancing existing products and services is complex, costly and uncertain, and any failure by us to anticipate customers' changing needs and emerging technological trends accurately could significantly harm our market share ... ," the report said. 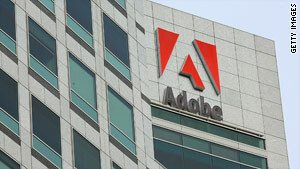 Apple and Adobe have long traded barbs over the issue. While most computers in the United States and abroad run Flash, and many game developers write for it, the company clearly would like access to Apple's devoted and highly plugged-in customer base. iPhone users, as well as those who choose other phones, frequently cite the lack of Flash as one of the phone's drawbacks. Risk statements like Adobe's are a routine part of SEC filings. Even the rosiest predictions include a list of things the company thinks could possibly make it underperform. Apple did not immediately respond to an e-mail from CNN.com seeking comment for this report.